) and click "Sign Up" on the top right. You'll be asked to fill in the sign up form. Fill in all the required fields and set your password to log into your member page. Your password must be more than 6 digits by alphanumeric characters. Regarding the “Venue” field, please choose "Truck Japan" from the pull-down menu. At least the field with asterisk (*) must be filled in. Click “Confirm” after the required fields are filled in. Review the information you filled in, accept the terms and conditions by checking the box, and click “Submit”. Then, you will receive a confirmation email from us. If you would like to change or correct any of your information, need our help, or have a question to ask, feel free to contact us. After the online registration, you need to submit the necessary documents to us in order to complete the membership registration. Also, you need to deposit security money of 100,000 Japanese yen (JPY) with us by bank remittance before making an actual bid. You are authorized to bid at auction after all the above procedures are completed. 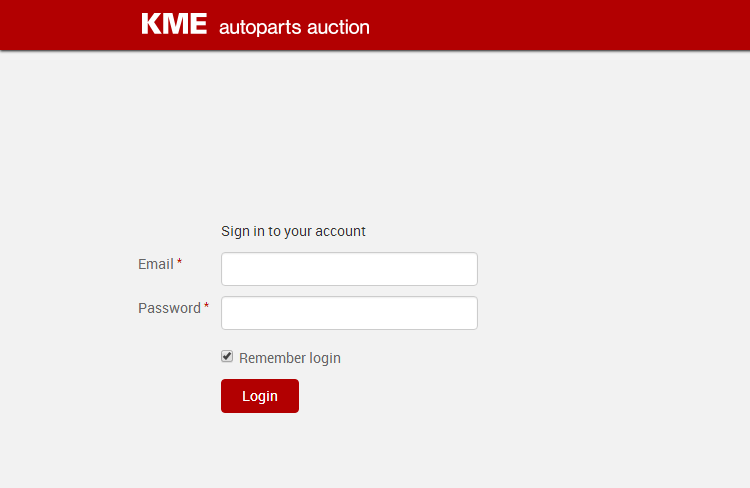 Open the top page of the auction website (https://www.kra-auction.com/) and click "Login" on the top right. Enter your email address and password and click "Login". Click "Schedule" and all schedules will be listed. If you click "Open", "Arranging" or "Closed", you can check each schedule of the auction status. * The standard time used for our auction (i.e. opening/closing time) is Gulf Standard Time (GST). 2-3.Open the list of vehicles exhibited in the auction. 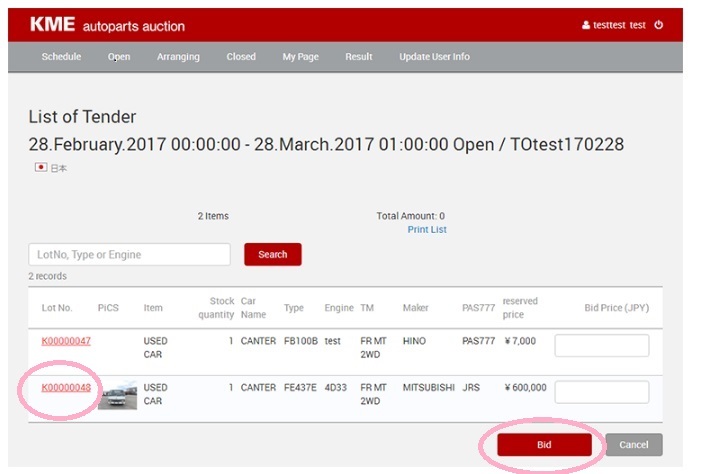 Click the number of the auction whose status is “Open”. Then, all the vehicles exhibited in the auction will be listed. 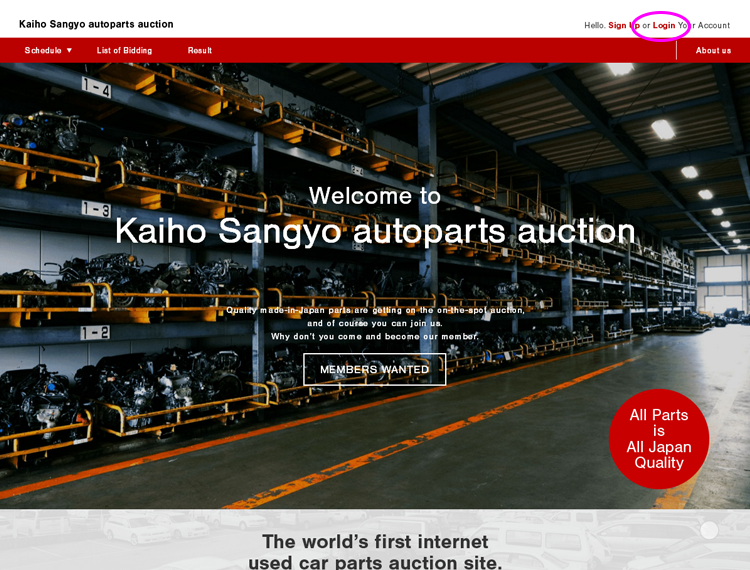 Enter your bid price (JPY) and click "Bid". For further details of the vehicles, click "Lot No". * If you want to change or cancel your bid amount, please reenter your correct bid amount or zero. 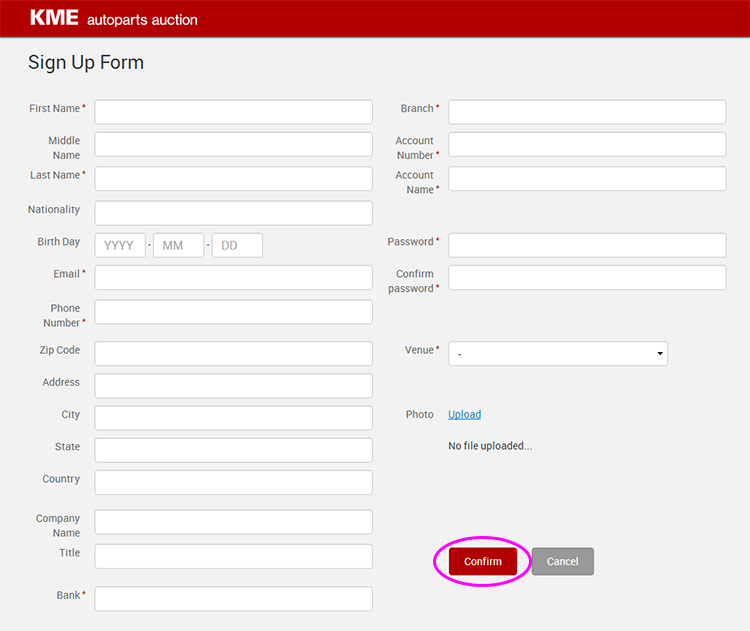 However, if you made the bid of the highest price, you cannot change or cancel your bid amount from the screen. In that case, please contact us immediately to change or cancel your bid amount. You can also make a bid on the screen of the vehicle detail. * Regarding recycling fee, it is mentioned in the remarks column. You will receive a notification email and invoice after the auction if you make a successful bid for a vehicle. Please remit a full payment to a bank account designated by us within 3 days (excluding bank holiday) from the next day of the deadline date of bidding. You need to pay (i) vehicle price (the amount by which you won the bid), (ii) successful bidding fee, (iii) consumption tax regarding (i) and (ii) above, (iv) recycling fee, (v) automobile tax which shall be borne by the successful bidder, and other expenses for transportation and custom clearance, etc. Recycling fees are determined on every car by individual truck manufacturers depending on the possible quantity of shredder dust and CFCs, number of airbags, and simplicity of taking off airbags. After we receive full payment from you, we inform you of a certain date as the delivery date of the vehicle by email. Please take possession of the vehicle from the exhibitor at the location designated by us within 6 business days on and from the delivery date. Upon your request, we will arrange a delivery and export of the vehicle to your designated destination. We will send you the documents necessary for the registration application or import of the vehicle as soon as they are ready. We will update you the price of the trucks at the previous auction and trucks information we are going to exhibit! Q. About the documents required to apply for the membership. A. You need to submit the following documents when you apply for the membership. Any other documents or materials designated by us. Q. About the deposit of security money. A. 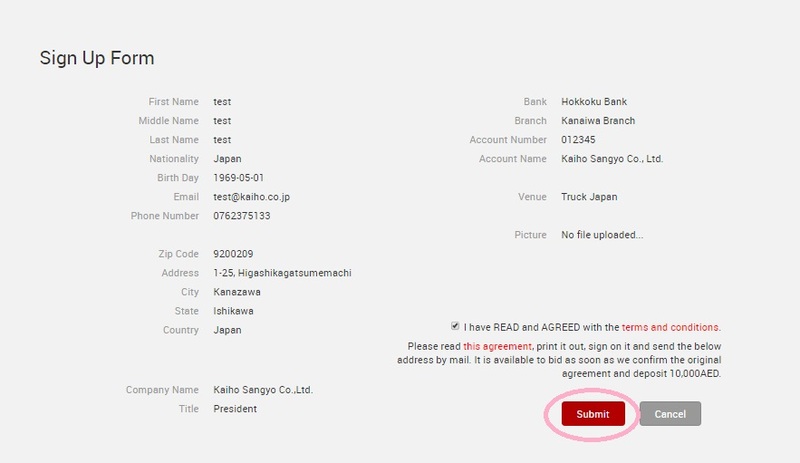 Bidding Member needs to deposit security money of JPY 100,000 in advance of making a bid in the auction. No interest shall accrue with respect to the security money. Please bear remittance fee of the security money (including the receiving bank’s fees for handling receipt of remittance from abroad, etc.). Hokkoku Bank (HKOKJPJT) / Kanaiwa Branch / Checking / 005831 / Kaiho Industry Co., Ltd.
Q. Do you return the security money I deposited? A.Yes, we will return the security money to a Bidding Member upon the Bidding Member’s request. However, the remittance fee for repayment of the security money shall be borne by the Bidding Member. Q. How much is successful bidder fee? A. 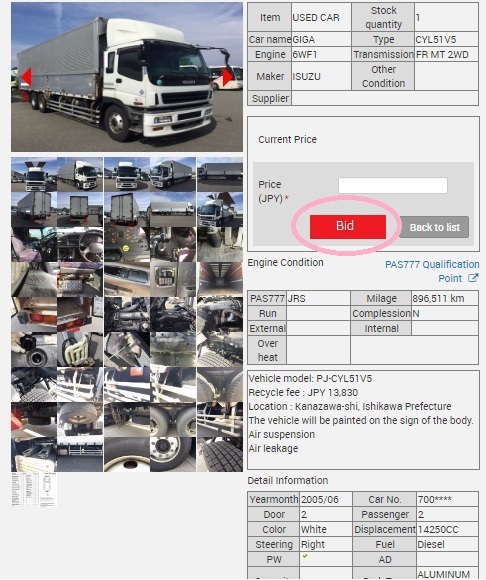 (1) Successful Bidding Fee: Small size vehicle /Middle size vehicle (total weight less than 8t): JPY 16,200 (tax included) per one vehicle.Large size vehicle (total weight 8t or more): JPY 21,600 (tax included) per one vehicle. (2) Shipping/Custom Clearance Fee, Expenses, Etc. :If we ship the vehicle which was successfully won by the bidder upon the successful bidder’s request, we will separately demand the payment of the fees and expenses, etc., relating to the shipment and custom clearance, etc. A. The successful bidder shall pay (i) vehicle price (the amount by which the bidder won the bid), (ii) successful bidding fee, (iii) consumption tax regarding (i) and (ii) above, (iv) recycling fee, (v) automobile tax which shall be borne by the successful bidder, and other expenses for transportation and custom clearance, etc. Q. About payment due date. Q.Do I have to pay consumption tax and recycling fee for the vehicle to be exported overseas? A. We will not charge you consumption tax and recycling fee if we arrange the shipping and custom clearance of the vehicle upon your request. Q. About automatic extension of bidding period. A. If there is a bid within the last 5 minutes of the bidding period, the auction period is extended for 5 minutes. The auction period is extended repeatedly if there is a bid within the extended bidding period. A. Among the bidding made during the bidding period, we determines that the bidder who made the bid of the highest price to be the successful bidder of the bid. However, the bid shall not be successful if the highest price is less than the lowest successful bid price. The display of the bid price turns green from red if the bid price reaches the lowest successful bid price. A. Upon your request, we arrange shipment and export of a vehicle to your designated destination. If you would like to use our shipping and export services, please request us within 3 days from the deadline date of bidding. Please contact us for more details on our shipping and export services. A. After we receive full payment from a successful bidder, we inform the successful bidder of a certain date as the delivery date of the vehicle. The successful bidder shall take possession of such vehicle from the exhibitor at the location designated by us within 6 business days on and from the delivery date. Upon your request, we will arrange a delivery of the vehicle. Q. Can I cancel the sale and purchase agreement of the vehicle of which I won a bid? (1) Cancellation fee of JPY50,000, (2) Exhibitor Fees (Agent Fee, Input Service Fee, Travel Expenses, and Successful Fees), (3) Consumption tax with respect to (1) and (2) above. Q. What will happen if I fail to make payment by the payment due date? A. If a successful bidder fails to make payment by the payment due date designated by an invoice, we may terminate the sale and purchase agreement by sending a notice to the successful bidder. In that case, the successful bidder shall pay us the following amount pursuant to our instruction: (1) Exhibitor Fees (Agent Fee, Input Service Fee, Travel Expenses, and Successful Fees), (2) Successful Bidder Fees, (3) Consumption tax with respect to (1) and (2) above. Furthermore, we may terminate immediately the membership of the member by sending a notice to the member. Copyright © Kaiho Industry co.,LTD. All Rights Reserved.